We export PTFE cables to Afghanistan, Albania, Algeria, American Samoa, Andorra, Angola, Anguilla , Argentina, Armenia, Aruba, Australia, Austria, Azerbaijan, Bahamas, Bahrain, Bangladesh, Barbados, Belarus, Belgium, Belize, Benin, Bermuda, Bhutan, Bolivia, Bosnia-Herzegovina, Botswana, Bouvet Island, Brazil, Brunei, Bulgaria, Burkina Faso, Burundi, Cambodia, Cameroon, Canada, Cape Verde, Cayman Islands, Central African Republic, Chad, Christmas Island, Cocos (Keeling) Islands, Colombia, Comoros, Congo, Congo, Costa Rica, Croatia, Cuba, Cyprus, Czech Republic, Denmark, Djibouti, Dominica, Dominican Republic, Ecuador, Egypt, El Salvador, Equatorial Guinea, Eritrea, Estonia, Ethiopia, Falkland Islands, Faroe Islands, Fiji, Finland, France, French Guiana, Gabon, Gambia, Georgia, Germany, Ghana, Gibraltar, Greece, Greenland, Grenada, Guadeloupe (French), Guam (USA), Guatemala, Guinea, Guinea Bissau, Guyana, Haiti, Holy See, Honduras, Hong Kong, Hungary, Iceland, India, Indonesia, Iran, Iraq, Ireland, Israel, Italy, Ivory Coast (Cote D`Ivoire), Jamaica, Japan, Jordan, Kazakhstan, Kenya, Kiribati, Kuwait, Kyrgyzstan, Laos, Latvia, Lebanon, Lesotho, Liberia, Libya, Liechtenstein, Lithuania, Luxembourg, Macau, Macedonia, Madagascar, Malawi, Malaysia, Maldives, Mali, Malta, Marshall Islands, Martinique (French), Mauritania, Mauritius, Mayotte, Mexico, Micronesia, Moldova, Monaco, Mongolia, Montenegro, Montserrat, Morocco, Mozambique, Myanmar, Namibia, Nauru, Nepal, Netherlands, Netherlands Antilles, New Caledonia (French), New Zealand, Nicaragua, Niger, Nigeria, Niue, Norfolk Island, North Korea, Northern Mariana Islands, Norway, Oman, Pakistan, Palau, Panama, Papua New Guinea, Paraguay, Peru, Philippines, Pitcairn Island, Poland, Polynesia (French), Portugal, Puerto Rico, Qatar, Russia, Rwanda, Saint Helena, Saint Kitts and Nevis, Saint Lucia, Saint Pierre and Miquelon, Samoa, San Marino, Saudi Arabia, Senegal, Serbia, Seychelles, Singapore, Slovakia, Slovenia, Solomon Islands, Somalia, South Africa , Taiwan, Tajikistan, tanzania, Thailand, Togo, Tonga, Tunisia, Turkey, Turkmenistan, Tuvalu, Taiwan, Turkey, Vanuatu, Venezuela, Vietnam, Yemen, Zambia & Zimbawe. Note:- We don’t do Retail Sales. We are one of the noted manufactures and exporters of an exquisite range of PTFE Insulated Wires And Cables. With the use of finest quality material accompanied by contemporary technologies we manufacture these cables and wires that provide excellent insulation. Available in different sizes, length and thickness our clients can purchase these from us at market leading rates. We BHUWAL CABLES noted as the foremost manufactures and exporters of PTFE Coaxial Cables. We use superior quality raw material that are sourced from the reliable vendors of the market to manufacture these cables. In addition these are processed under the sophisticated technologies. We offer these products to our clients at cost effective price. Delivering of quality PTFE Lead Wires is our prime motive. We Owing to the experience of our experts we aim at providing complete satisfaction to our customers by offering an exquisite range of High Tensile Cables. These are used for fencing as well as electrical wiring. Using excellent quality raw materials we manufacture these products. 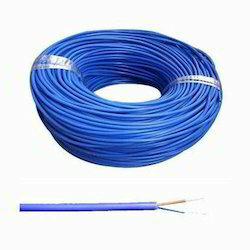 We offer highly durable PTFE Shielded Cable at reasonable prices. These cables consist of two different parts: the conductor and the insulator. They are applicable in cars, tractors, trucks and electric traction vehicles. Our products also find applications in batteries used in telecommunication set ups, power inverters, computers, solar and wind power. We provide these product in user defined colors and dimensions. Properties: Resistant to Fire, Chemicals, Sunlight, Moisture & Corona Resistant. We BHUWAL CABLES are the leading manufacturer, exporter and supplier of an extensive range of PTFE Cable that is designed as per the latest technological developments. The raw material we use in fabrication process is well-tested on various parameters to ensure unmatched quality of the products. These cables are offered in different specifications in order to meet the varied needs of our prestigious clients. We BHUWAL CABLES specialize in manufacturing PTFE insulated hook-up wires. We offer PTFE insulated silver, nickel, tin plated and bare copper hook up wires. Our PTFE insulated SPC/TPC/NPC wires, are widely used in electronic equipment, defense equipment, railways, aircrafts, aerospace research, radar, satellites, heat sensing leads, atomic power station, telephone- exchange, etc. Extremely useful for miniature cable applications, as they possess unique thermal and electrical properties. We introduce ourselves as one of the noted manufacturer, trader, exporter and supplier of PTFE Insulated High Voltage Cables . The best quality of raw material in a perfect ratio is used to manufacture our offered cables. These cables are precisely tested for tested conductivity, tensile strength by our dexterous professional which helped us to come up with such distinct range. These cables are available in full range of sizes and shapes at industry-leading prices. Our range of PTFE insulated coaxial cables are of very fine quality. They are used in data transferring, satellites and to transfer data codes: RG 196 A/U , RG 188 A/U , RG 178 A/Q , as per MIL C17 or JSF 51100. They have excellent resistance to fire, chemical, acids, sunlight, moisture and corona. We provide them with different voltage grade such as - 250V, 600V, 1000V, etc. They are offered in different sizes. 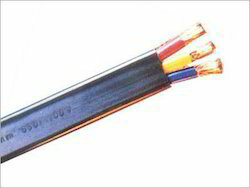 We are recognized as the renowned manufactures and exporters of a wide range of Furnace Cables. Using superior quality raw materials and latest technologies we manufacture these. We have a team of professional experts to supervise the manufacturing process of these cables. These are tested on certain parameters before getting delivered in the market. Our clients can purchase these products from us at competitive price range. We have gained enough expertise in developing special kinds of aviation cables. Our products are highly popular and they are capable of covering the complete range of primary, secondary and remote cables. Our high quality cables are highly suitable to be used in wet or dry conditions in metallic/nonmetallic conduits, ducts, aerial and direct burial installations. Our cables are utilized in various airports and are in use for more than a decade. We, Bhuwal Cable Limited is the most trusted name engaged in offering the quality range ofAsbestos Braided Cables. We use premier quality raw materials and sophisticated technologies to manufacture these cables. We have a team of skilled laborers empowered by the professional experts to manufacture these cables. Our clients can avail these from us in varied specification that too at market leafing rates. We are considered to be one of the major manufacturers and exporters of Cables for Motors. We use superior quality materials and latest technologies to manufacture these products. Our team of professional experts supervises the manufacturing process of these motors. These are available with various specifications and one purchase it as per choices that too at reasonable rates. PTFE Insulated Wire-Various replacement cable assemblies for commonly used applications and equipment are readily available. These cable assemblies are built using materials identical to those found on original equipment assemblies to assure reliability and performance at affordable costs.